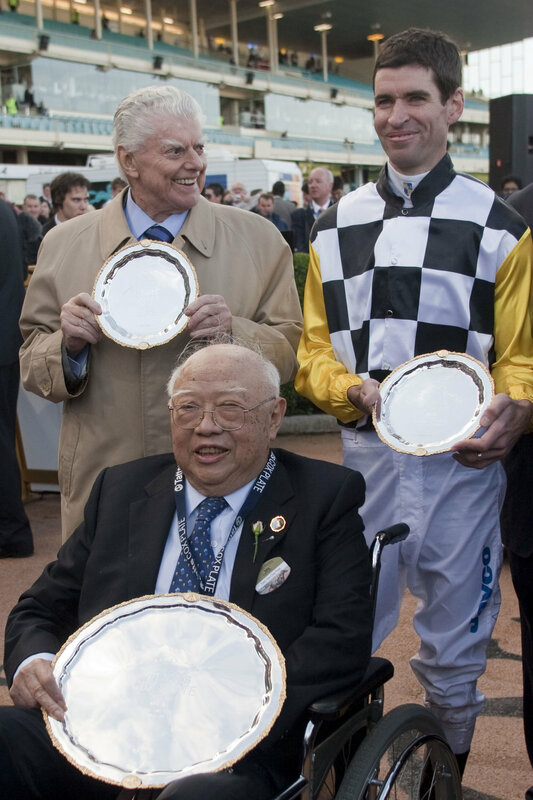 Dato Tan, the late Bart Cummings & jockey, Steven Arnold after So You Think's second Cox Plate victory in 2010. Dato Tan Chin Nam is a giant in both the business and thoroughbred world shaving set new benchmarks in both disciplines in his home country of Malaysia and in Australia. The sixth of 12 children, Dato Tan rose from humble beginnings as a roadside vendor selling vegetables, chickens and fruit during Japan’s occupation of his country to establish himself as one of his nation’s most significant businessmen. His achievements as a property developer have allowed him to make generous contributions to two of his other passions, chess and horse racing. His first foray as a racehorse owner couldn’t have been more spectacular when,in 1971 he selected a colt from Bart Cummings’ yard and named him Think Big. Singled out with the Melbourne Cup in mind, the bay gelding was raced with Queensland developer Rick O’Sullivan and duly obliged when saluting in 1974. So enjoyable was that initial experience that Dato Tan invited his close friend,former Malaysian Prime Minister Tunku Abdul Rahman, into the ownership and together all three shared in Think Big’s second Cup win 12 months later. Despite a hiatus from racing during the 1980s the mercurial owner has now won four Melbourne Cups and is one of the most successful owners in Australian history. Aside from Think Big’s heroics, Dato Tan has also won three Cox Plates, a Caulfield Cup, three Derbies, two Oaks and countless other group one events around the country. But it is as the part-owner of Saintly, and more recently, So You Think that Dato Tan will forever be remembered. These greats of the Australian turf have won hearts and minds across the nation and pushing the boundaries of racetrack excellence by making the impossible seem possible. Importantly, the moments created by these and other track stars have been even more rewarding for Dato Tan because they were shared with close friends including Tunku Ahmad Yahaya (So You Think), Ananda Krishnan (Danarani and Danendri), Bart Cummings (Saintly, God’s Own and Roman Emperor), Wilf and Rosemary Mula (Roman Emperor), Su-Ann Khaw (Wonderful World, God’s Own and Allez Wonder), Dr. Michael Alexeef (Wonderful World and Allez Wonder) and Dr. Alan and Colleen Jackson (Faint Perfume). In 2005, the Moonee Valley Racing Club honoured Dato Tan for his contribution to the Australian industry by naming one of its feature spring events after him. Two years later he extended his involvement in the thoroughbred industry when establishing the boutique stallion operation, Think Big Stud. This venture is close to Dato Tan’s heart and continues to receive the single minded focus previously directed at his other successful business endeavours. His determination to breed high class racehorses has already been rewarded. A number of stakes winners have been bred and sold by Think Big Stud including Faint Perfume who was crowned Australia's Champion Filly of 2009.